For the past 20 years, medical technology (medtech) has been the largest category of patent applications to the European Patent Office. The industry shows no sign of slowing down either, with innovation addressing challenges such as the ageing population and increased long-term disease management. 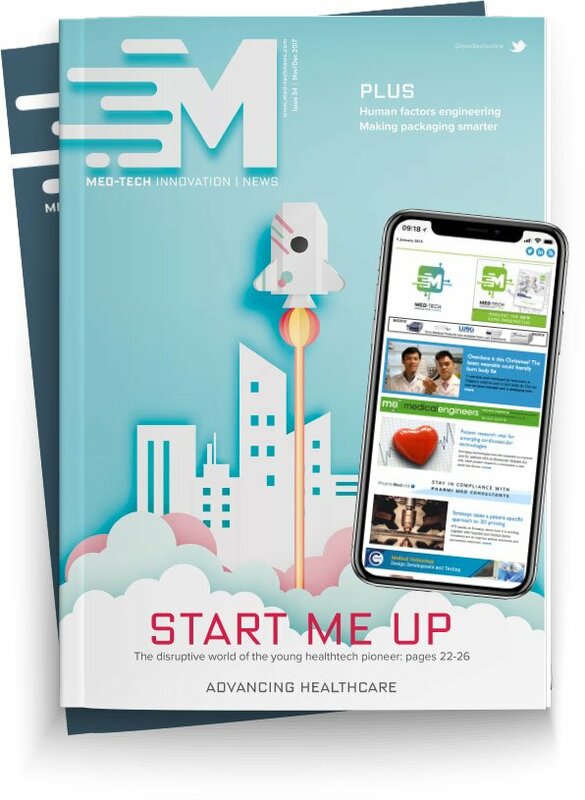 With the recent Compamed exhibition bringing together the world’s medtech experts, Neil Oliver, technical marketing manager at professional battery manufacturer Accutronics, looks at the three trends dominating the current healthcare market. Among the 779 exhibitors at the fair, digitalisation was prevalent on many of the stands. From virtual reality to healthcare apps, digitalisation is influencing the medical market as it is with countless others. The technology surrounding medtech is subsequently responding to this, with miniaturised components and cybersecurity being hot topics around the trade fair. For the past few years, the medical wearables market has grown substantially. With many countries facing an ageing population with increasing long-term health conditions to manage, home healthcare or healthcare outside of the traditional hospital setting is playing a greater role in care plans. Wearables have been featured at Compamed for many years now and are able to measure numerous types of data for numerous health conditions. Every year, more and more vitals become measurable with wearables. For example, devices exhibited this year could monitor a person’s pulse, arterial oxygen saturation, heart rate variability, respiratory rates, vascular stiffness and blood pressure. This will help with diagnostics, reducing the time that people need to spend in hospital and allowing patients and medical practitioners to monitor conditions over a long period of time without the need to come in for regular tests. Another concept that was exhibited at Compamed was diagnostics at the point of care. For example, lab-on-a-chip technology aims to perform genetic analysis and diagnosis of pathogens on a single integrated circuit from a few millimetres to a few square centimetres. While this is a field that is still developing its applications, the microcomponents that power this type of technology were on show at Compamed. Exhibitors of all components recognised that as the devices get smaller, the components need to work just as effectively, but must take up less room in the device. However, it is vital that the device manufacturers understand that power is one of the most essential components of a wearable device and take steps from the start of the design process to recognise this. It is far too late in the design process to create a small space for a battery to go in the device and then simply ask a battery manufacturer to fill the space. While it is often possible to do this, it is often not the most effective use of space in the device. When battery manufacturers are involved from the start of the design process, they can work with the original equipment manufacturer (OEM) to create a battery that fits the power requirements of the device, whether these are in terms of overall lifespan and cycle life, energy density or any additional security requirements for medical devices. With digitalisation a hot topic at Compamed and recent high profile cyber-attacks across the world, it came as no surprise that the topics were linked in many discussions. Despite the attack not being aimed at medical devices, the recent WannaCry ransomware attack still had a dangerous impact, with a well-known US medical company receiving two reports of US customers with infected medical devices. Device manufacturers are waking up to the recommendations of the US Food & Drug Administration (FDA), which argues that medical device manufacturers are responsible for identifying risks and hazards involved with their medical devices, including those related to cybersecurity, and must put appropriate mitigation in place to address these risks. One of the fundamental aspects of ensuring cybersecurity of devices is data encryption and, in particular, ensuring that software uses an up-to-date algorithm to reduce the risk of devices being compromised. But it’s not just the device itself using algorithms for security; batteries can use it too. In the electronics industry, battery counterfeiting is an ongoing concern as the quality of fake duplicates is constantly increasing. The security risk of this for a medical device is clear. The counterfeit battery could shut down unexpectedly, provide erroneous runtime data or be electrically unsafe. Device manufacturers must take responsibility and follow the FDA’s regulations and ensure that this could not happen in their device by working with experienced suppliers. At Accutronics, we offer algorithmic security based on a secure hashing algorithm (SHA-1) which allows devices to integrate their installed battery and alert the user if a counterfeit battery is being used. One of the key challenges facing medtech manufacturers in coming years is the introduction of the new EU regulations for medical devices. Regulation (EU) 2017/745 for medical devices and Regulation (EU) 2017/746 for in vitro diagnostic medical devices will replace all preceding directives and come into force in spring 2020 and spring 2022 respectively. The EU Commission argues that the regulations will establish a more “modernised and robust EU legislative framework to ensure better protection of public health and patient safety”. For example, an EU database of medical devices will be created to increase transparency, as well as a device traceability system based on Unique Device Identification. This introduces new design and manufacturing considerations for OEMs. With the increase of implantable devices as part of the wearable trend, the new rules have been updated to ensure the safety of patients that have these devices. While often limited and varying information was given to the patients before, an implant card must be provided by the manufacturer and will be given to all patients with implanted devices. Information such as the serial number and the origin of the implant will be given to the patient on the card, to ensure transparency and reduce the risks that any malfunction may present. Manufacturers have some years to perfect their approach to these new regulations before they come into play, but it is essential that they devote time and expertise to ensuring that they are prepared for them. In the medical device market, it is always best to follow good practice. As the medical device market continues to grow in both size and complexity, OEMs must work with experienced suppliers who can advise on issues such as device design, cybersecurity and new regulations. In doing this, they can ensure that they will produce a device that is compliant and successful in meeting the needs of the market.